Today we have another guest post treat – this time from Katie, the author of the blog, The Creative Counselor. She is the test sewer who made this version of the Jedediah Pants. She used a gorgeous recycled hemp and organic cotton blend and widened the legs to create a totally different style of pants than our slim fit originals – I love how well these pants display the versatility of a well fitting pants pattern – all you have to do is adjust the width or length of the legs to create endless varieties and styles! Kathryn of The Creative Counselor’s recycled hemp and organic cotton pants. She has altered the leg width to create boot-cut pants! Hello Thread Theory readers! 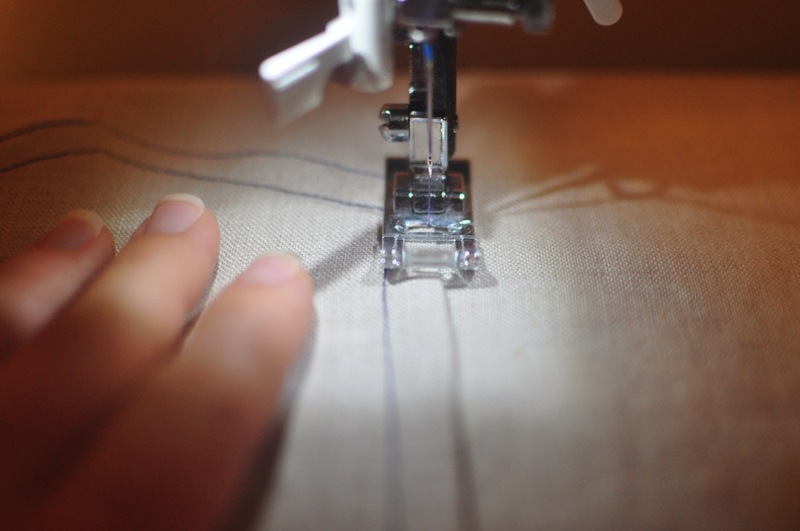 I’m Katie and I blog about my sewing and crafty creations over at the Creative Counselor. I was one of the lucky three ladies who got to be pattern testers for the Jedediah Pants, and got my greedy little hands on the pattern before the rest of the world. I know you will all soon come to love this pattern as much as I do, if you don’t already! One of my favorite things about the Jedediah pattern is the beautiful seam finishes that Morgan has included throughout the pattern. When starting my pants, I told my husband that this would likely be the only pair of pants that he owned with actual flat-felled and bound seams on every single seam. And I was right! While constructing my Jedediah Pants, I decided that I wanted the back pockets to have a similarly beautiful finish that enclosed all of the raw edges. 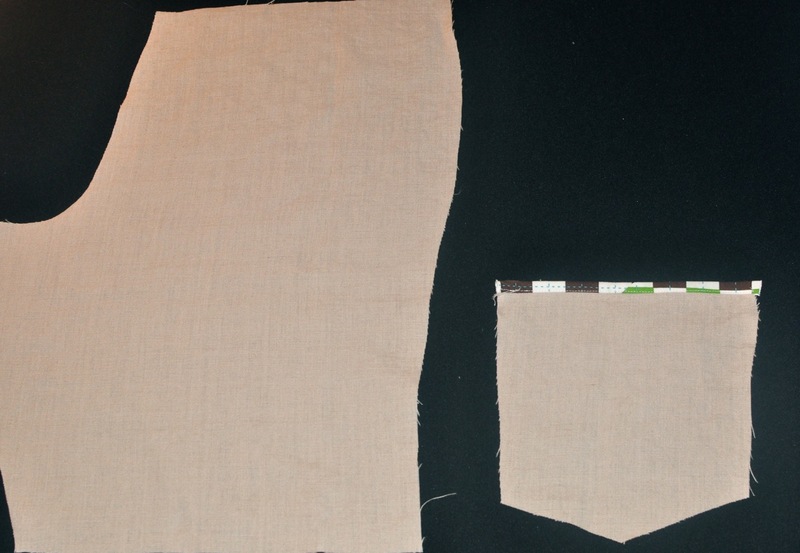 With that in mind, I examined some of our nicer RTW jeans and puzzled out how to finish the back patch pockets so that all of the raw edges were enclosed and the whole pocket looked neat and tidy. 1. 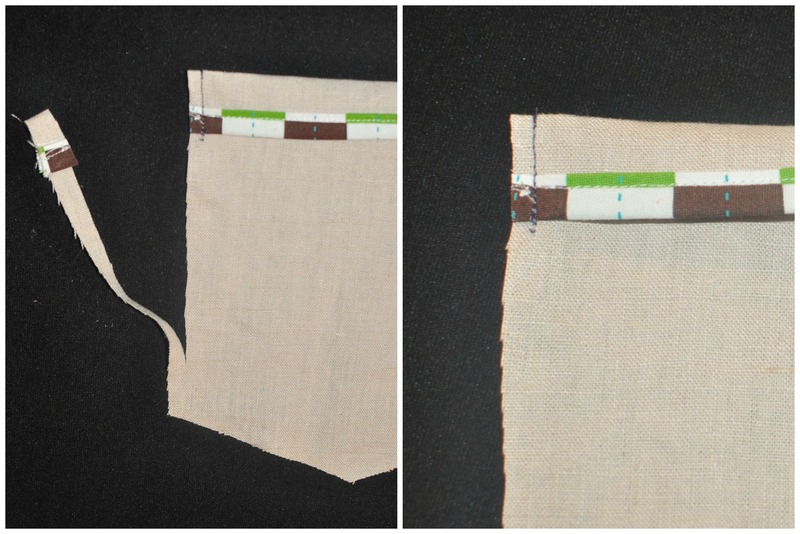 Attach bias binding to the top edge of your back pocket piece, following the instructions included in the pattern. 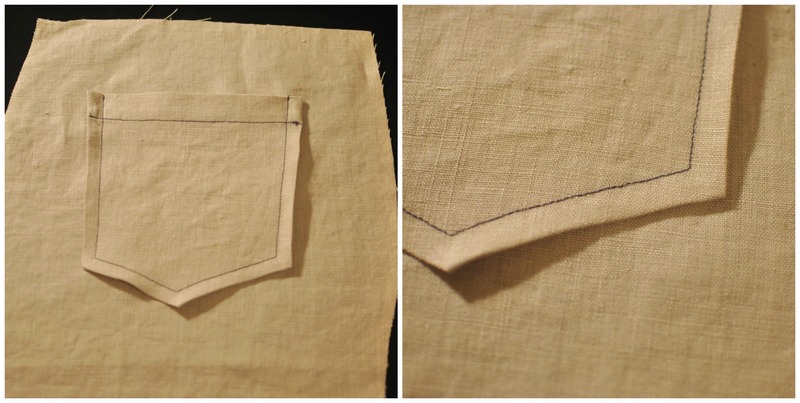 Alternatively, if you don’t want to bind the top edge of the back pocket piece, you can serge or sew a zig zag on this edge, or turn the top edge down ¼” (wrong sides together) and press. Personally, I like the bound edge here — those small hidden details make a pair of handmade pants special and truly unique. 2. Fold the top pocket edge along the marked fold line right sides together. Do not press this edge at this point. 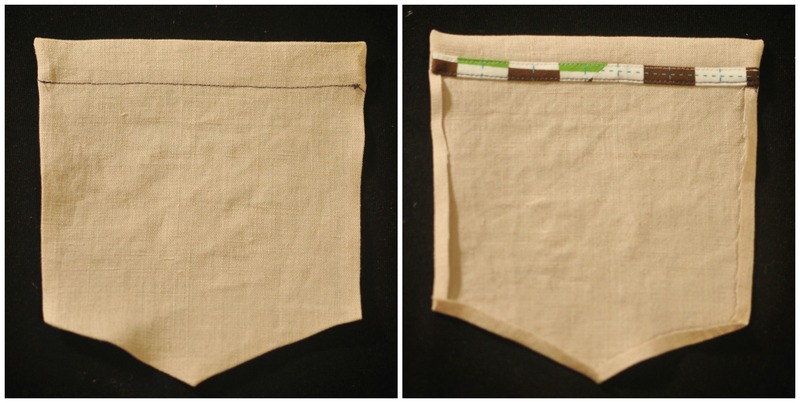 Pin it down and stitch the fold down vertically ⅝” in from each side (also per the pattern instructions). 3. Here, the pattern instructions will tell you to trim your seam allowance to ¼”, meaning that you will trim off about ⅜”. Do trim your seam allowance to ¼” but rather than stopping where your stitching stopped, trim off that ⅜” all the way around your pocket piece. 4. Flip your top edge over so that the wrong sides are now together, and use a point turner or a chopstick to push out the corners, making them nice and pointy. Press the top edge of your pocket. 5. Carefully fold in the other edges of your pocket piece (remember, your allowance has now been reduced to ¼”) and press them. Be very deliberate here so that all edges are crisp and the point at the bottom is nice and clean-looking. 6. 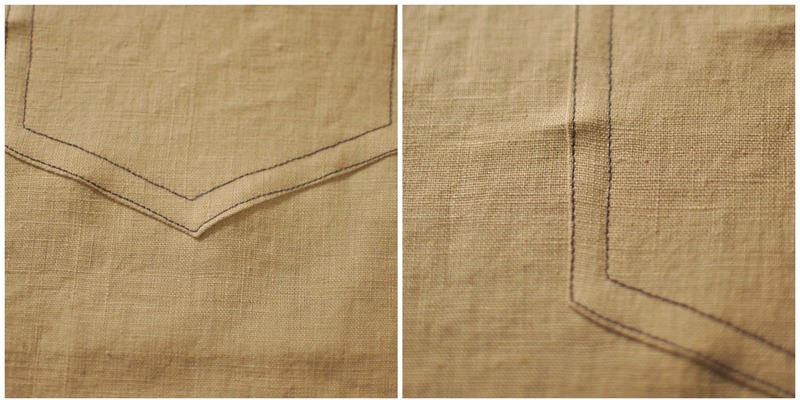 Stitch down the folded top edge of your pocket. 7. Position the pocket on the back pants/shorts piece and pin in place. 8. 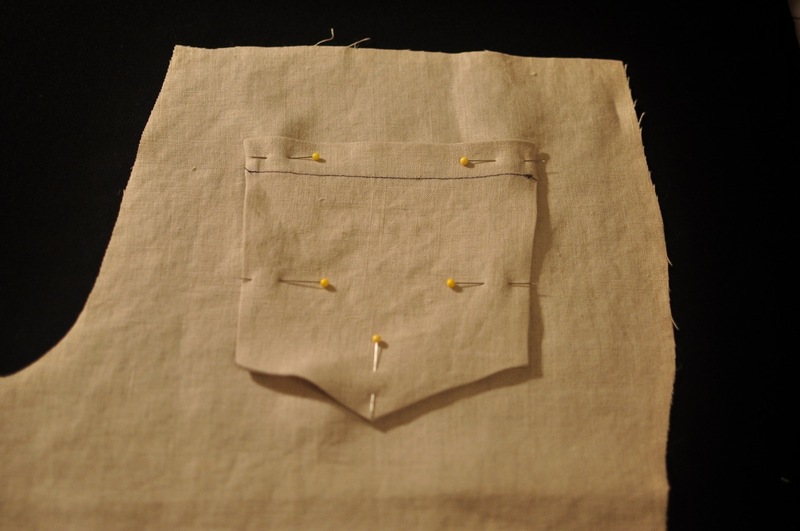 Topstitch the pocket down using a ⅜” allowance. 9. 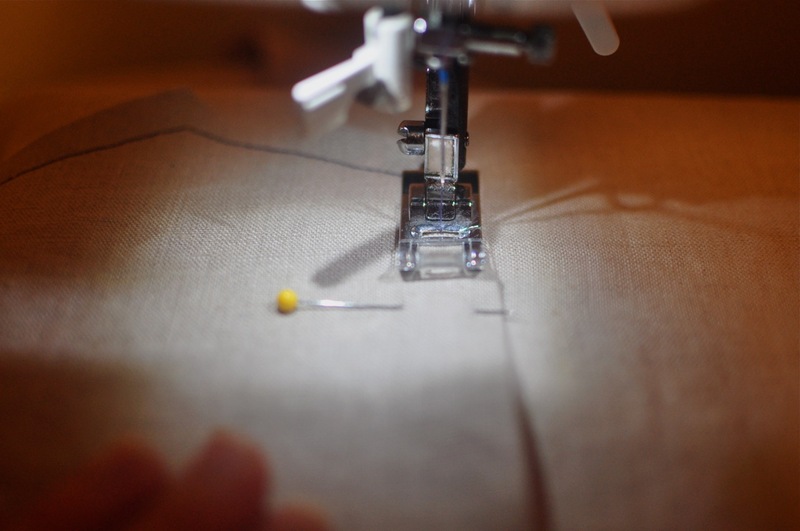 Once the pocket is attached to the shorts, you’re going to sew a second parallel line of stitching by edgestitching around the very edge of the pocket piece. 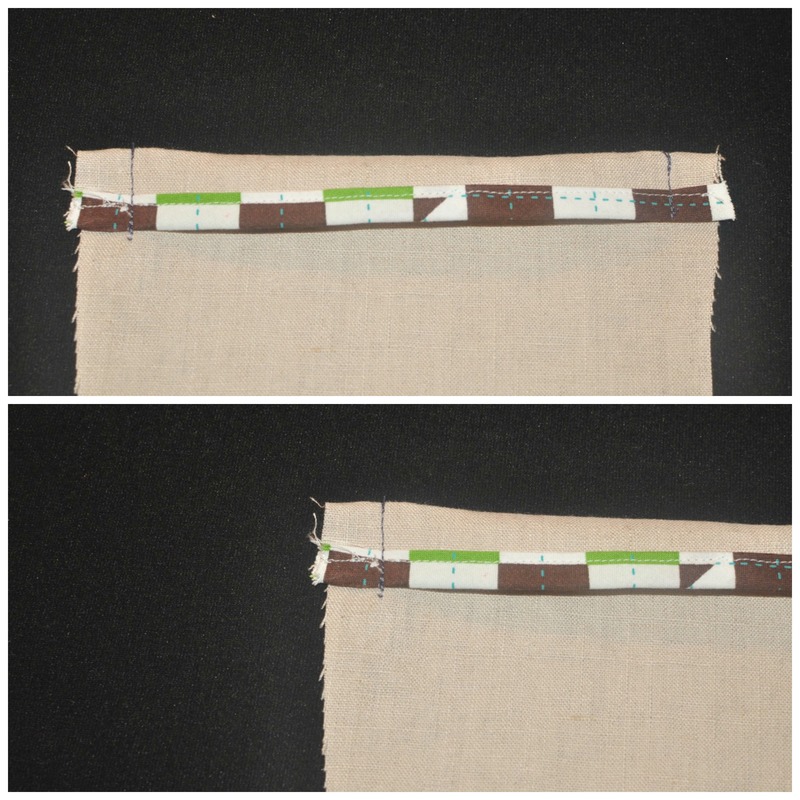 This ensures that the raw edges of your fabric are neatly enclosed between these two seams. 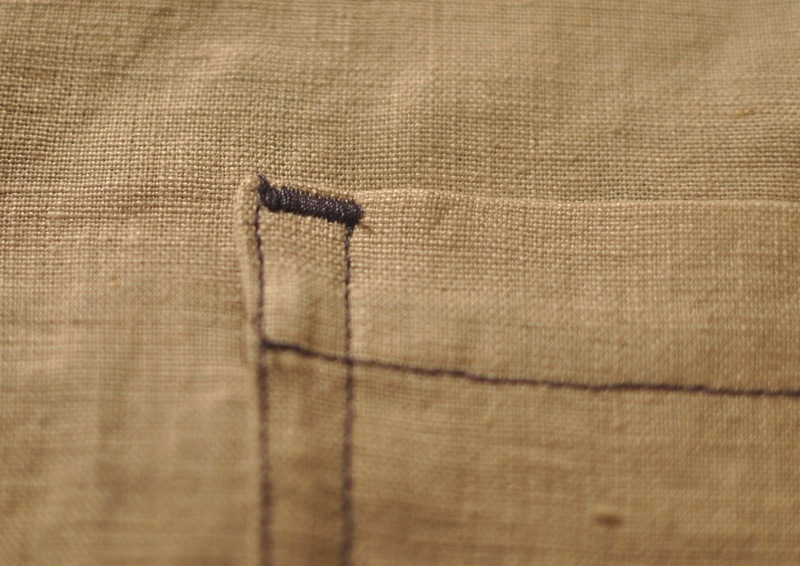 You could, of course, do this edgestitching first, but I find that it is far easier to control the stitching and get a really nice-looking edge stitch if the pocket is already secured with the inner row of stitching. 10. 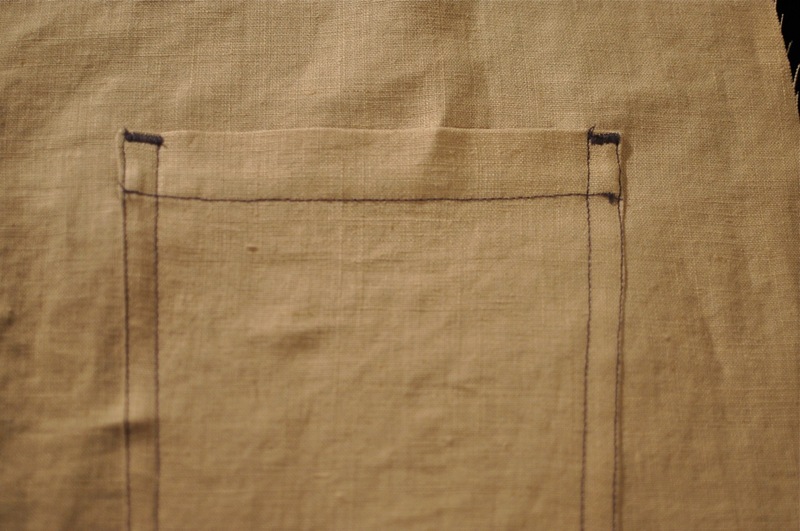 Strengthen the top edge of the pocket either by stitching triangles in each top corner, or by placing a bar tack in each corner. You’re done, and ready to continue on with your shorts! Take a moment to sit back and admire the prettily-finished back pockets. Thanks so much for having me Morgan! I can’t wait to see everyone’s finished shorts! 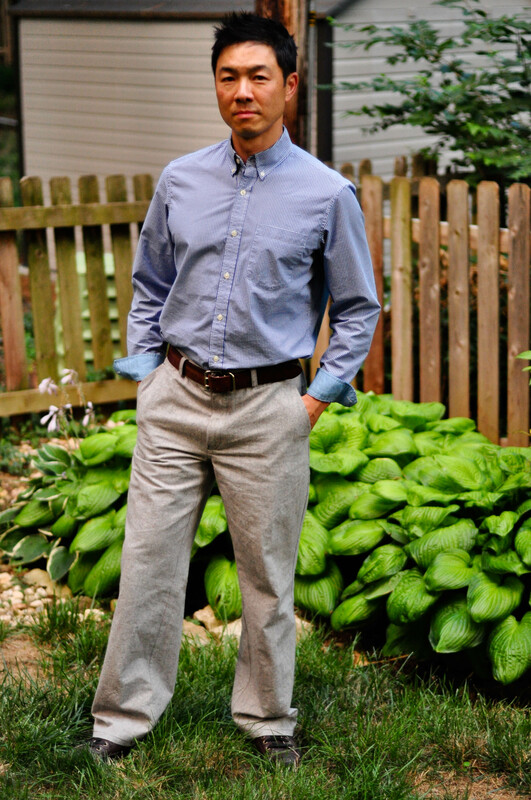 Categories: Guest Bloggers, Jedediah Shorts Sew-along | Tags: guest post, Katie | Permalink. Wow, Katie, that was so clever! I’ve read many sewing books ( I own over 20!) and I don’t think I’ve ever seen that before. Thanks! I just did something to eliminate raw edges in a pocket but mine was far more fussy and instead of removing fabric, added it! I’ll use yours next time. I’m so glad this was helpful to you! I just love nice finishes. What a great tutorial. 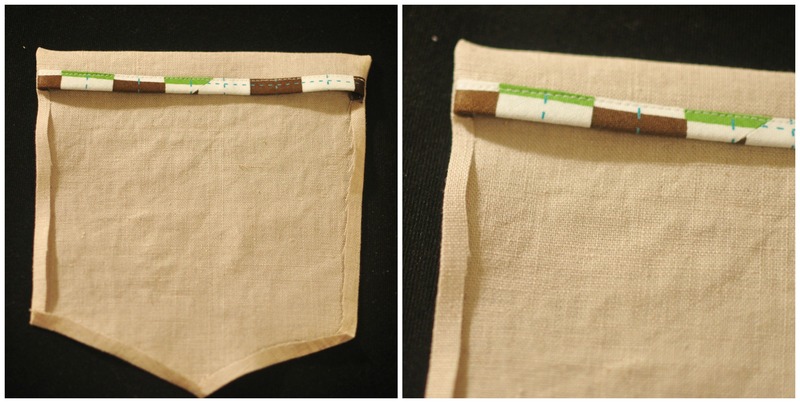 I shall use this method from now on for patch pockets I think! Thanks! I’m so glad you found it helpful! I agree! Are you making your legs wider as well? I look forward to seeing how it turns out for you! I will leave that decision up to the mister 🙂 I will keep you posted! Aw, thanks Melissa! I hope your mister loves his pants!